Preschool Math and Letters Made Fun! Turkey Fun With My Darling Daughter! Today for Preschool Kaylee learned about the letter E and what sounds it makes. We also are practicing our counting up to five. 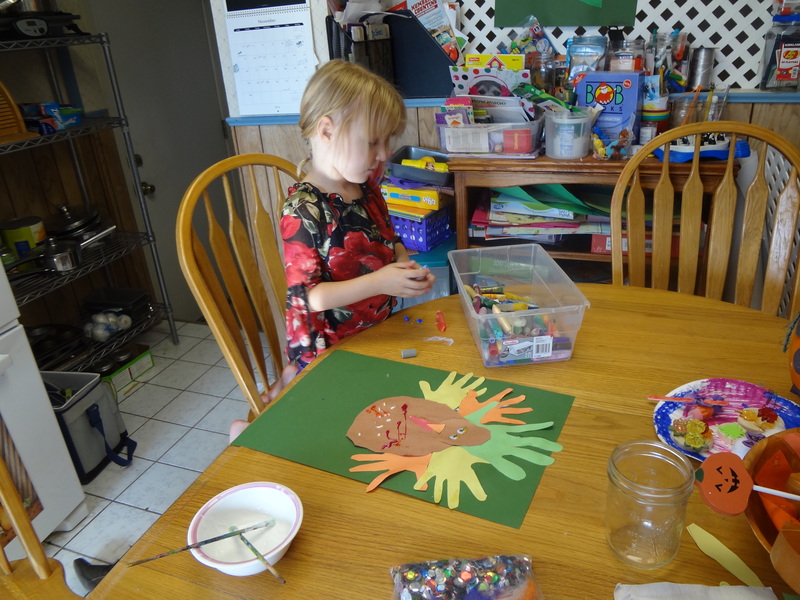 For fun I’ve been wanting to do a turkey craft with her since it is almost Thanksgiving. Just seems like a fun traditional activity that Preschool kids get to do. I think there are at least a 100 different ways to make a turkey. We made our turkeys feathers by tracing hands and cutting them out. Kaylee traced mine and I traced her. We both cut and she did most of the work including cutting out the body. Great little cutter she it!!!! She loves her pink scissors. Kaylee is into glitter glue and so she went through at least twenty different colors. She made a very sparkly picture. She asked me to help and of course I did. It was fun. I kind of got carried away and made a crown on top of the turkey’s head. Kaylee loves when I do projects with her. 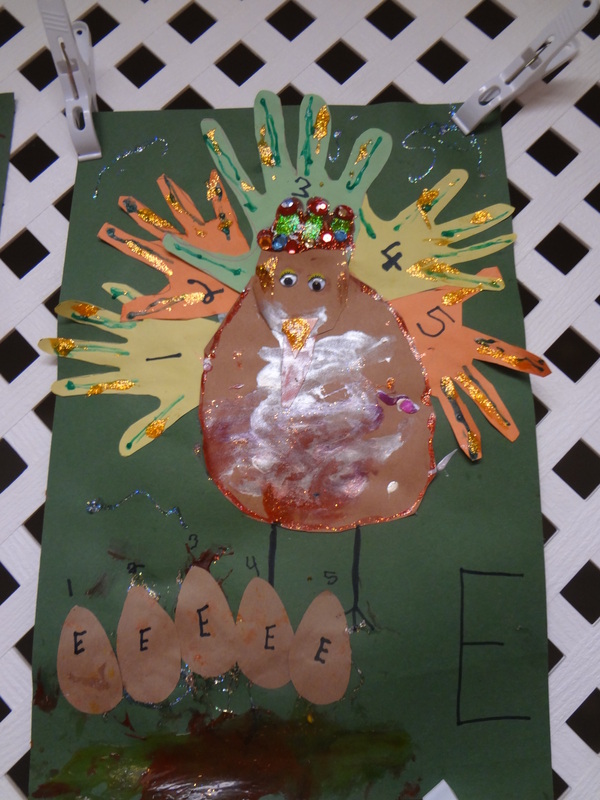 I cut out eggs for her to glue onto the nest that she had made under the turkey with glitter. Eggs stand for letter E as I put an E on each egg. We counted five feather hands. Each hand got its own number. In all seriousness, please excuse me if this is too much information but Kaylee made poop at the very bottom of the page under the turkey. It’s the most colorful poop I’ve ever seen. Leave it to Kaylee to include such details as poop. Sorry if I just grossed you out. So the reason for posting, is to encourage you to have fun with your kids when you are teaching them letters and numbers. Preschool age kids learn best by playing! ← Mom You Are Your Child’s Hero and You Are Enough!